1. Combine dried fruits, ginger, pineapple, sugar, butter and spices in a saucepan and bring to the boil stirring occasionally. Simmer for 5 minutes. Remove from heat and stir in macadamia nuts and bicarbonate of soda. Allow to cool. 2. Line the sides and base of 8 x 1 cup capacity dariole moulds with baking paper. Stir eggs and flours into fruit mixture and spoon into the moulds. Bake at 160°C for 45-50 minutes or until golden and cooked when tested with a skewer. 3. 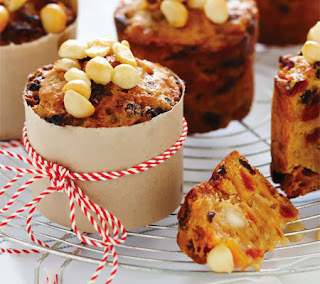 Combine remaining macadamia nuts, honey and butter and spoon over each cake. Return to the oven and bake for a further 8-10 minutes or until nuts are golden. Cool in moulds before turning out carefully.